Miqdadiyah (Arabic: المقدادية‎) (also transliterated Al-Miqdadiyah, Miqdadia, Muqdadiyah). Shareban (شهربان). 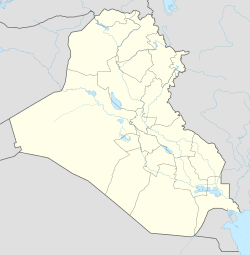 Al-Muqdadiyah is a city in the Diyala Governorate of Iraq. The city is located about 80 km northeast of Baghdad and 30 km northeast of Baquba, the capital of Diyala. It has a population of about 298,000 inhabitants. The alternative name of the town is Shareban, mentioned as such in the works of the classical writers such as Ptolemy and Strabo. Sharaban (from Shahraban, from old Iranian, Shatrapan) transforms into satrap in Greek and means a governor or a governorate. This name is still used locally As of late, however, the term Muqdadiyah has largely replaced the old name. "Muqdadia" stands for Persian "Given by the Magi", and Baghdad means "Given by God". The local Shias believe that Muqdadiya is named after Miqdad ibn Aswad Al-Kindi (Arabic: مقداد بن الاسود الكندي) was one of the Sahabah of the Islamic Prophet Muhammad. Miqdad is venerated by Shi'a Muslims as one of the Four Companions, early Muslims who were followers of Ali ibn Abi Talib. Miqdad ibn Aswad is among Shi'as regarded as one of the most respected Sahaba. He is mentioned in one Hadith regarding the perfect Shia, he was one of the Muhajirun. However, they fail to demonstrate exactly how this town is connected Miqdad ibn Aswad in order to be named after him. The city has a mixed population, with Arabs (both Shia and Sunni) forming the majority. Other inhabitants are the Kurds and Turkomans. Before their mass expulsion in the course of the 1960s and 1970s, the Shia Faili Kurds constituted the majority of the town's population, followed by the Shia Turkomans. The Kurdish population is now a small minority. ^ Malayeri, Mohammadi (1375). فرهنگ ایران در دوران انتقال از عصر ساسانی به عصر اسلامی، جلد دوم. دل ایرانشهر، تهران، انتشارات توس. This page was last edited on 22 December 2018, at 06:18 (UTC).